It's an honor to be asked to deliver a keynote — you want to be at your best. The longer a speech is, the easier it is to get lost in the text. It might take a couple of hours or half a day to write a short speech, but a keynote can take weeks to draft, edit, and finalize. Organization and outlining can save you endless hours of revisions. Understand your audience. Who are they and how do they relate to your subject matter? What are their hot buttons? How can you get them to not just be in the audience, but to listen and agree? What are the words, phrases, or information points that will get heads nodding in agreement? Start at the end. What do you want the audience to do? In a perfect world, what would every person be inspired to get up and do after listening to your speech? Everything in your speech should build up to that call to arms or point of resonance. If you bring the audience there in a straight line, or if you telegraph it, the speech will be boring. Split it up into three parts – and split those parts into three. It's tough to tackle a 30-minute speech, but by splitting it into three sections of 10 minutes apiece, then taking those three sections and divide them each into three, you can work on the 10 three-minute segments independently until they're polished. It isn't an iron-clad rule, but a technique that's a good way to make sure each part of your speech is balanced. If you simply write out the entire text, the structure might get lost. You could spend 15 minutes describing a problem and two minutes on the solution without realizing. Variety, variety, variety. If your speech is nothing but statistics, the audience may turn on you. Any sort of repetition must have a purpose. Too much of a good thing turns bad. 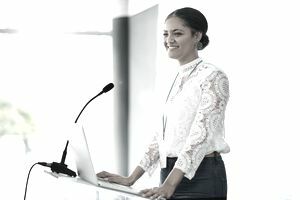 A solid keynote speech has variety: stories about real people, examples from history, metaphors, interesting numbers, new ideas, and other exciting moments to keep the audience engaged. A great speech doesn't simply string those things together. It weaves them like a tapestry and takes the audience on a roller coaster. Look at each section of the speech and ask yourself, "Which emotions will the audience feel? What about the section before and the section after?" The speech shouldn't be random or repetitive. Even if you're talking about a tough issue, like hunger or disease or an economic downturn, there's a reason you're speaking — and that reason is hope for change. Thirty minutes of "this is a horrible, horrible problem" and "thank you for letting me speak" won't work. Give the audience hope that they can make a difference or fuel for further contemplation on the topic, and offer concrete and specific courses of action, along with the rationale and expected outcome. Explicitly saying "You can do something" is too direct. in Hollywood, they'd say that dialogue is "on the nose." Tell real stories about average people, not billionaires or geniuses, who made a difference. Local people, if you can. Make it real to your audience. There's probably somebody in the audience who are affected by this issue or has worked as a volunteer or advocate. That person's story is rhetorical gold. Don't start with it, end with it. Learn About Reporters' Terms like "off the Record" and "on Background"